As a teenager, Kate Harris realized that her dream career — that of an explorer — had gone extinct. From her small-town home in Ontario, it seemed as if Marco Polo, Magellan, and their like had long ago mapped the whole earth. So she vowed to become a scientist and go to Mars. As a diversion from her studies, she set off by bicycle down a short section of the fabled Silk Road. But somewhere in between sneaking illegally across the Tibet border, studying the history of science and exploration at Oxford, and staring down a microscope for a doctorate at MIT, she realized that an explorer, in any day and age, is by definition the kind of person who refuses to live between the lines. So Kate quit the laboratory and hit the Silk Road again to bike it from beginning to end, writing Land of Lost Borders in the process. 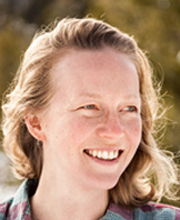 Kate’s award-winning writing appears in The Walrus, Canadian Geographic, The Georgia Review, and other publications. A Rhodes scholar and Morehead-Cain scholar, she was named one of Canada’s top modern-day explorers. She lives off-grid in a log cabin in northern British Columbia.